Sunday evening is usually family time and I spend my Sunday afternoon with my brother and his wife. Sometimes we go out but most Sundays we prefer to follow the family tradition, meaning cooking together and just hanging out at home. The best part of family life is spending good times together, making and sharing memories. There’s a especial sense of trust and honesty when we’re with our family, something that makes us feel safe and accepted. One of my college professors at film school used to say: “What you see on the screen is a reflection of reality” and I believe that. “Blue Jasmine” is a movie but it also can be a real life story that we may hear from a friend, co-worker or neighbor. Not all families are the same. We don’t choose our blood family and if it’s not the type of supportive family we need, the only choice left is to love them but go out and choose the type of kindred friends who can become our adapted family, those who are honest with us and accept us for who we are. After all, intimate human connections, either with our blood family or adapted, are what help us to survive and be happy. What you see here is our last week Sunday dinner. I’m hoping you will try it at some point, while making your own especial memories with your loved ones, and enjoy it as much as we did. Heat the olive oil in a pan and sauté the fish with the remaining of the black pepper, sea salt and taco powder on low temperature for a bout 15 minutes. 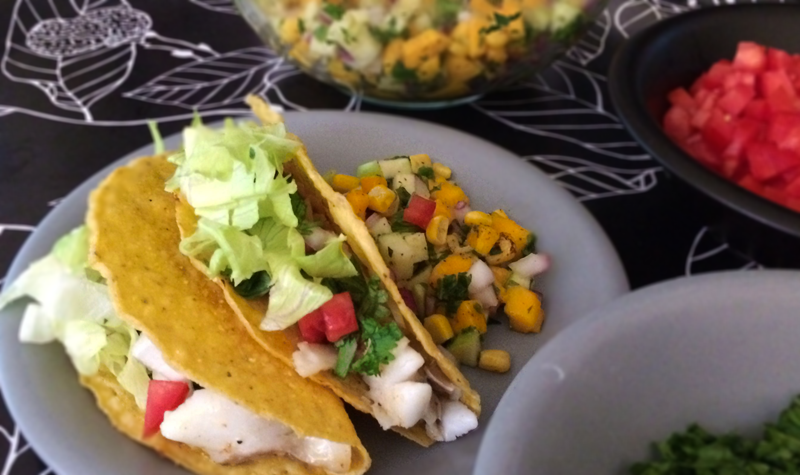 This entry was posted in Animals, Family, Food, Gluten Free, Healing, Health, Humanity, Life, Main Dishes, Recipes, Uncategorized and tagged Dinner, Easy Recipe, Family, Food, Gluten Free, Healing, Health, Healthy Eating, Life, Mango Salsa, Seafood, Tacos. Bookmark the permalink.